Oklahoma Connection | Everett came to Oklahoma City, Oklahoma, and the University of Oklahoma in 1924. After Dr. Mark R. Everett became dean of the OU Medical School in 1947, the school added a full-time faculty and within only a year was given full accreditation status with the American Medical Association and the Association of American Medical Colleges. 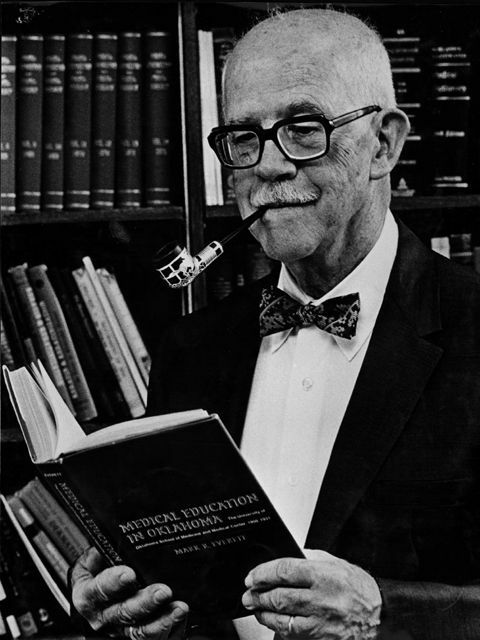 Renowned medical administrator and professor Dr. Mark R. Everett was born in Pennsylvania and graduated from Bucknell University (1920) before receiving his doctorate in medical sciences from Harvard Medical School (1924). Dr. Everett and his wife, Alice, then came to Oklahoma City, where Dr. Everett was appointed chairman of the University of Oklahoma’s medical college’s department of biochemistry and pharmacology. In 1928, he led the move of the medical school from the Norman campus to Oklahoma City and was named Dean of the Medical School in 1947. Dr. Everett held the position of chairman of biochemistry from 1936 to 1964, when he retired and was named dean emeritus and consulting professor. He received a 1974 award from the American Association for State and Local History with the publication of his book, Medical Education in Oklahoma and the Everett Tower at University Hospital was named in his honor.